July is the month of the Full Buck Moon. Bucks begin to grow new antlers at this time. 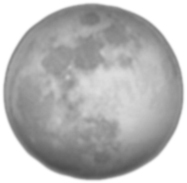 This full Moon was also known as the Thunder Moon, because thunderstorms are so frequent during this month. The second full Moon this month will be on July 31 at 3:45 A.M. The month of June’s full Moon’s name is the Full Strawberry Moon. June’s Full Strawberry Moon got its name because the Algonquin tribes knew it as a signal to gather ripening fruit. It was often known as the Full Rose Moon in Europe (where strawberries aren’t native).